The LM386 is quite a versatile chip. 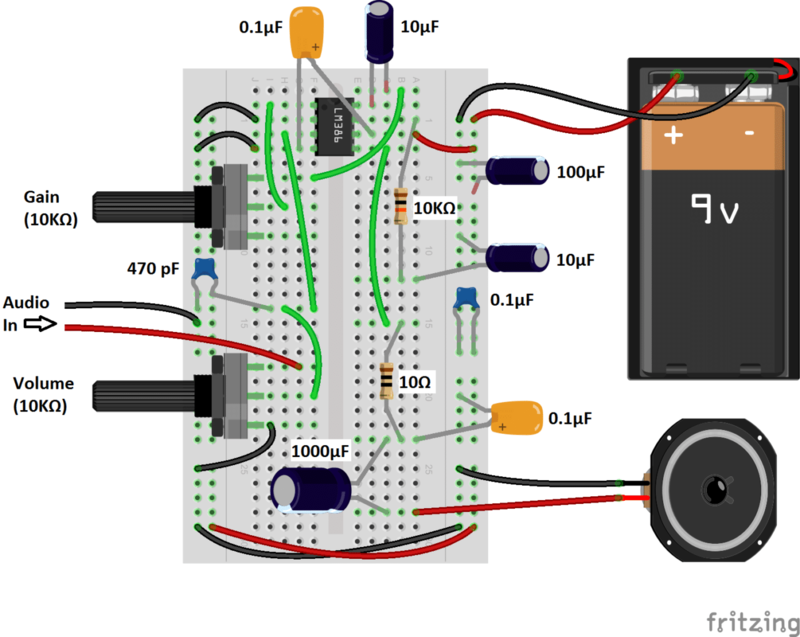 Only a couple resistors and capacitors are needed to make an operational audio amplifier. It has functions for gain control and a bass boost, and it can also be turned into an oscillator capable of outputting sine waves or square waves. 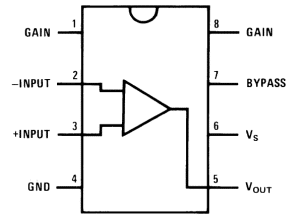 The LM386 is a type of operational amplifier (Op-Amp). Operational amplifiers have a basic task. They take an input potential (voltage) and produce an output potential that is tens, hundreds, or thousands of times the magnitude of the input potential. In this circuit, the LM386 takes the audio input signal and increase its potential anywhere from 20 to 200 times. 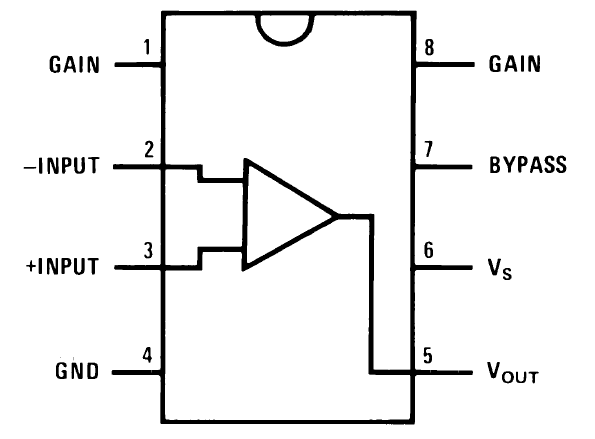 That amplification is what is known as the voltage gain. 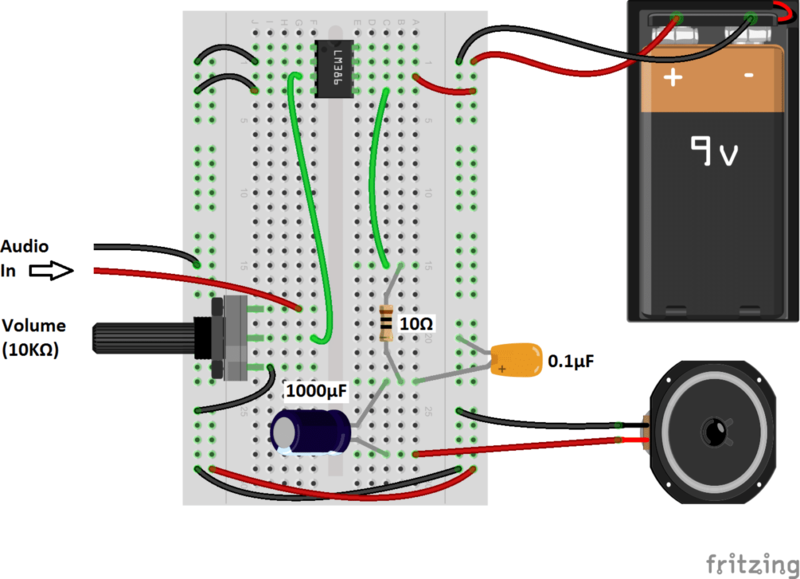 After you build this amplifier and play with the volume and gain controls, you will notice that both appear to raise or lower the intensity of sound coming out of the speaker. So what is the difference then? Gain is the amplification of the input potential. It is a characteristic of the amplifier. Volume lets you adjust the sound level within the range of amplification set by the gain. Gain sets the range of possible volume levels. For example, if our gain is set to 20, the range of volume is 0 to 20. If our gain is set to 200, the range of volume is 0 to 200. The main pins to be aware of are pins 2 and 3, the audio signal input, and pin 5, the positive audio output signal. 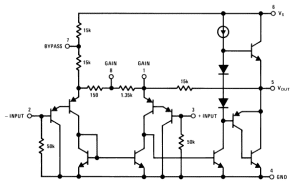 Gain control can be achieved by bridging pins 1 and 8 with a 10 μF capacitor. If pins 1 and 8 are not connected, the output gain will be 20. With only a 10 μF capacitor, the gain will be 200. 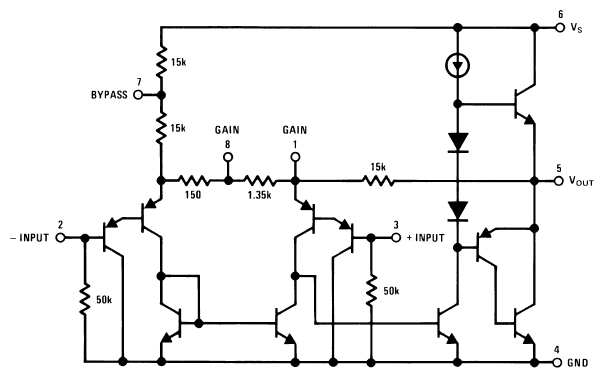 The gain can be adjusted to any value between 20 and 200 by placing a potentiometer in series with the capacitor. Now that we have a little background into the LM386, we can build the amplifier. Just as a comparison, I will show you how to make a minimal LM386 amplifier first so that you can compare it to the better sounding one we will build later on. You will probably notice that this amplifier produces a lot of noise, static and popping. To fix this, we need to add some decoupling capacitors. Decoupling capacitors isolate the amplifier circuit from signal interference caused by fluctuations in power and filter noise from the audio signal. Larger value capacitors will filter lower frequency noise while smaller value capacitors will filter out higher frequency noise. A 470 pF decoupling capacitor between the positive input signal and ground. A 100 μF and a 0.1 μF capacitor between the positive and negative power rails to decouple the power supply. The 100 μF capacitor will filter low frequency noise while the 0.1 μF capacitor will filter high frequency noise. A 0.1 μF capacitor between pins 4 and 6, for additional decoupling of the power supply to the chip. A 10K Ohm resistor and a 10 μF capacitor in series between pin 7 and ground to decouple the audio input signal. One thing to keep in mind when you’re wiring LM386 circuits is that the cleanest sound will result from keeping all wire connections and components as close as possible to the chip, and keeping the wires as short as possible. A nice way to input the audio in these circuits is to use a 3.5 mm audio jack from an old set of headphones. Check out this article, How to Hack a Headphone Jack to learn how to re-wire almost any kind of headphones. Thanks for reading! 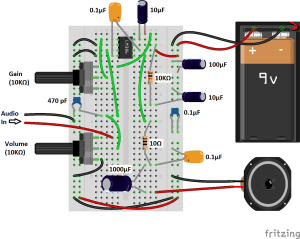 Hope you had fun experimenting with this circuit as much as I did. Be sure to subscribe to the blog to keep updated on posts as soon as they are published. 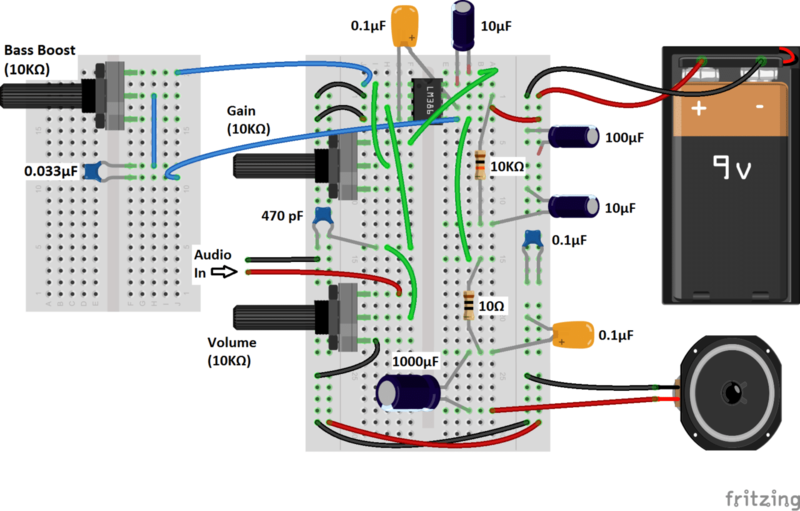 I will be writing a lot more how-to guides for other audio circuits in the future. And feel free to leave a comment if you have any questions or need help with anything in this article.